There are nearly 100 Parisian streets, squares, boulevards etc. named after mathematicians in our archive. A location map for these streets is at THIS LINK. Mostly, of course, they are French but there are some others too. For example, there is a place on the Avenue Marceau about 300 metres from the Arc de Triomphe where streets named after Newton, Galileo and Euler all come together. Perhaps the most surprising fact is that there is no Paris street named after Fourier. A Walk around the the Latin Quarter of Paris is available at THIS LINK. 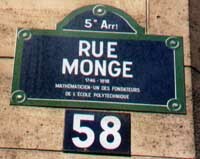 The Mairie de Paris have a website at THIS LINK giving the history of all Parisian street names and if you click on the M next to the street you can see these details. You can see a map by clicking on the G next to the street name. The French Wikipedia has entries on most streets also. You can see these by clicking on the W next to the street name. Thanks to Pierre Charles Pradier, Frédéric Grosshans, Evelyn Lamb and Knut Hegna for telling me about some I missed, to Francis Clarke for telling me of some I had wrong, to Joe Lestrange for telling me about the Wikipedia links and to Karen McVicar and Michael Angelasto for telling me where the Mairie of Paris had moved their files to.